Back by popular demand — Freaky Fiddle Friday Scotty Stoneman Edition. The people have spoken, and we have listened. Back by popular demand is the Freaky Fiddle Friday! We kick it back off with the man that Jerry Garcia called his inspiration for his endless jamming — Scotty Stoneman — the Jimi Hendrix of the Fiddle. Man could that guy play the fiddle, great stuff here. Jump to 2:10 for the fiddling fireworks! 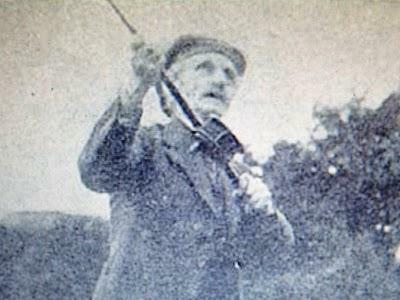 Midcurrent pointed us toward an interesting article today about Alexander Grant, one of the pioneers of Speycasting. Born in 1856 at his family’s croft at Battangorm near Carrbridge in the Highlands of Scotland, Grant began his illustrious fishing career in the silvery waters of the River Spey system. As a young boy he was also exposed to his other great passion in life – playing the fiddle. So much was his early interest in the acoustic properties of these instruments that he once refused to attend fiddle lessons from the local school teacher because he disliked the tone of his tutor’s fiddle. This early appreciation of tone and vibration was something he used in later life to outstanding effect in the design of his famous ‘Grant’s Vibration’ range of fly rods. Later in the article it gets to the heart of an issue I’ve been wanting to explore in more detail, the relationship between building acoustic instruments and building rods. I knew there was a connection, now I have PROOF! Well, if nothing else then at least it’s proof that someone else in human history was just as savagely deranged as I. The real secret to success of the greenheart rod however, was the rod’s specific taper, which was worked out acoustically, rod by rod. As a talented musician, Grant also handcrafted his own fiddles and in doing so began experimenting with the principles of vibration frequencies. The information he learned was applied with great effect to his rod making room. He realised that as a natural product, the density of wood varied. This meant that two rods made to the same length, diameter and specifications different actions. Grant tuned each individual rod section as such that he could produce a rod that flexed in total unison. This meant that instead of each section ‘springing’ slower or quicker than the others, the rod’s action was totally married, resulting in a very powerful through-action. Unbelievable! The connection between music and fly fishing is unmistakable! Well I haven’t done a Freaky Fiddle Friday in a while. But I miss it, so here goes. Today I bring you the fantastic straight ahead and old timey pair of fiddle tunes by Luke Abbott. He plays two classics, Angeline the Baker and Apple Blossom. Do yourself a favor and also check out his album called, Take Me Home. It sounds like this young man has a very promising career as a solo musician. It’s difficult thing to make this material interesting as a solo artist, but he sure pulls it off convincingly. His guitar and banjo work is also quite solid and voice perfectly workable in a traditional sense. Good stuff. Via the Federal times comes news that in an effort to save money the Obama administration has decided to consolidate websites in order to save the government money. While in principle I think this is a good idea and generally speaking support the theory of consolidation, he has, by calling out this group, given this action a face and a human personality. The danger here is for people like me who support all things folky and traditional to use that face and personality as leverage to mount a campaign against this action, and yet again make him look like a buffoon. If he hadn’t been specific and called them out by name, then how could you argue with it, right? But now there will be legions of people using this as a lever against him. Well, ok, maybe not legions, a half-a-dozen maybe, but the point is, its a bit of Americana, and there ARE legions of people out there, who think our society is loosing great things such as string band music, like Brazil is losing rainforest, and these things need to be conserved. Obviously, he isn’t breaking up the band, or telling them they can’t exist, but the headlines on this one write themselves, and anymore, our Hamsterized little brains only pick up the headlines, oooh look squirrel. Take a peak at the top of this page for goodness sake, thats all anyone will see, nobody reads down this far, not even my mother! Here is a video purported to be the Fiddlin Foresters providing the soundtrack to a little movie about the Man Gulch Fire. If you don’t know about the Man Gulch, you need to get out more. If the Fiddlin Foresters weren’t very well known before, I bet they’ll be getting an agent and record contract and a book deal now. TLC won’t be far behind with a reality TV show too. Details and quote form the story below. Nothing Freaky about this one. There’s some good historical info at the beginning, so listen up. I love all the variations, this is what contest fiddling is all about, fantastic. There is absolutely nothing freaky about today’s Freaky Fiddle Friday. Just some straight up good fiddlin around. Today we are featuring, the incomparable Bobby Hick’s playing one of his signature tunes Fiddle Patch. I could listen to that all day. Ok so in honor of the royal wedding today’s Freaky Fiddle Friday features Brad Leftwich playing Bonaparte’s Retreat. There is all sorts of Folklore surrounding this one. I was always assumed it to be in favor of the Brits, but apprently Wikipedia thinks it’s an Irish tune in favor of Napolean, who knew. “The Bonny Bunch of Roses” Lyric goes like this so feel free to sing along. The unity can ne’er be broke. He was so well provided. Enough to sweep the world along. He lost the bonny Bunch of Roses, O. But now I droop my youthful head.